Last weekend was my birthday, so we took the day off from responsibilities and went on a little road trip. I LOVE road trips, and going down new roads. So, on our adventure I drove. That way I got to go down any unknown road I wanted! Truckin' Man is more of thinking to take the most direct way from point A to point B. Guess that comes with his occupation. Living in the Mississippi River Valley there is no end to scenic overlooks, but for our road trip I remembered seeing signs for the ferry that runs across the Mississippi from Cassville, Wisconsin to Guttenberg, Iowa. I knew it is a popular road trip for bikers and they do seem to always know the scenic routes! 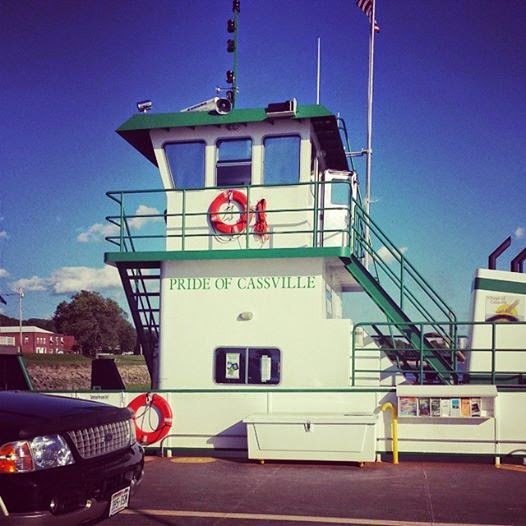 Here is where we waited for the ferry in Cassville, Wisconsin. This really was quite the experience. When you live in the midwest, there are very few large bodies of water, and even fewer opportunities to take a ferry ride! I really didn't have the chance to take any photo's during on ride, as I was lucky enough to meet the captains wife, and chatted with her the entire trip. A view of the Mississippi from the Iowa side of the river. Barges are a very common site on the river. Hope you enjoyed this little bit of life near the Mississippi. Happy Birthday ~ what a great way to celebrate. I have not toured much of the Mississippi. I would love to take a River Boat someday. Thank you for the tour. I always enjoy your trips. Happy "belated" birthday. Looks like you spent it in a pleasant way. The ferry ride would be fun and what pretty scenery.